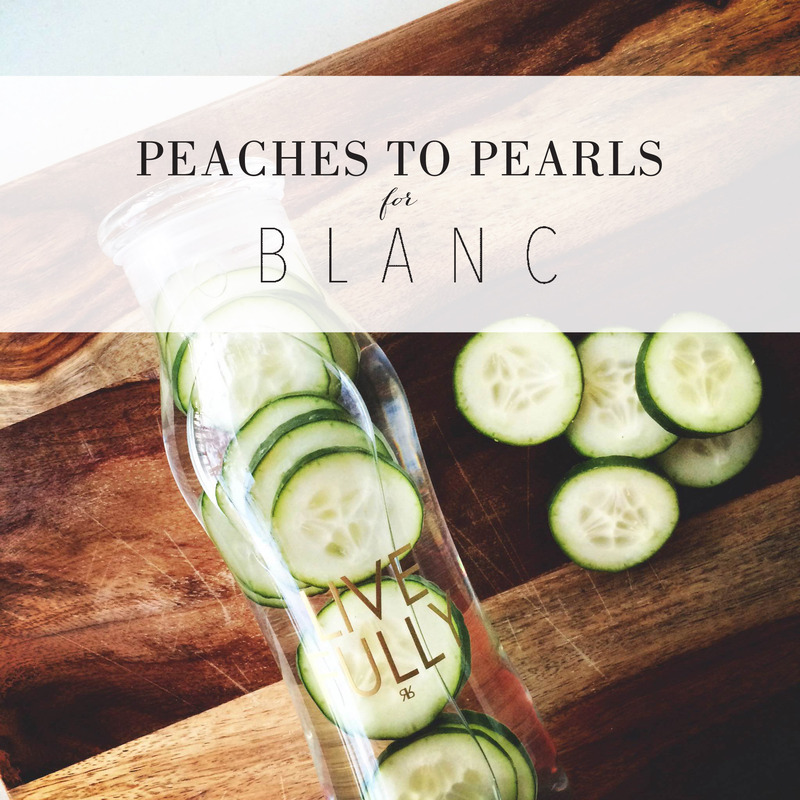 Hi Blanc Blog readers! Let me begin by introducing myself before you think I’m a crazy blog hacker – my name is Luisa from Peaches To Pearls. It is such an honor to be able to be a guest blogger here today. Isn’t Miss Tarah just ridiculously talented? And adorable. And witty. Okay Okay you get it – I’m a big fan! To tell you a little bit about myself – I am currently obtaining my Masters in Clinical Nutrition at Georgia State University in Atlanta, Georgia. I am passionate about food (ALL food- I don’t discriminate! Except pickles. I hate pickles.) and affordable fashion. Everything you find on my blog is purchased on a student budget! 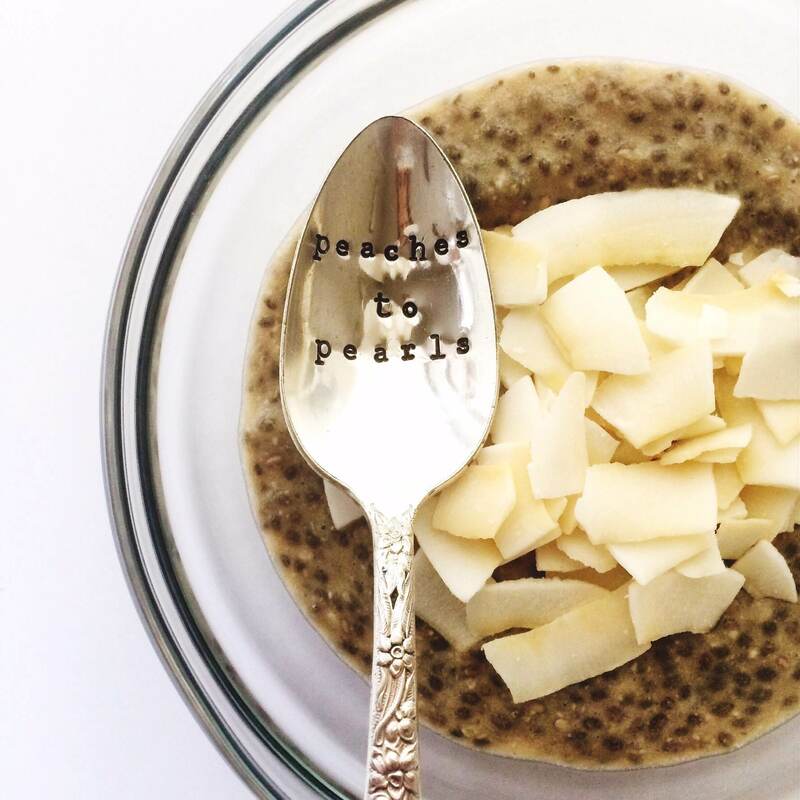 Today I want to share with you a little bit about my #eatpretty15 challenge. Before I scare you away, please understand that I am not your typical healthy-nutrition enthusiast. My favorite meal is a juicy burger and I hate kale salads. BUT I do believe in moderation. I believe that you don’t have to starve yourself to be pretty and you don’t have to give up everything delicious to get skinny. I do believe that you should have more good (healthy green stuff) in your daily diet, than bad (greasy French fries). So hopefully I have gained your trust and you are dying to know what exactly this #eatpretty15 challenge is all about. I believe that you don’t have to starve yourself to be pretty and you don’t have to give up everything delicious to get skinny. For the next 5 weeks (January 12 – February 15), I will give you a challenge. The name of the challenge came from an amazing book I read last month called Eat Pretty, by Jolene Hart, where she gives detailed information on how food affects our beauty. Each week’s challenge has been inspired by her book and by the physician/dietitian recommended Mediterranean Diet. Method 1: Do one week at a time. Do as much as you can handle and one weekly challenge at a time. 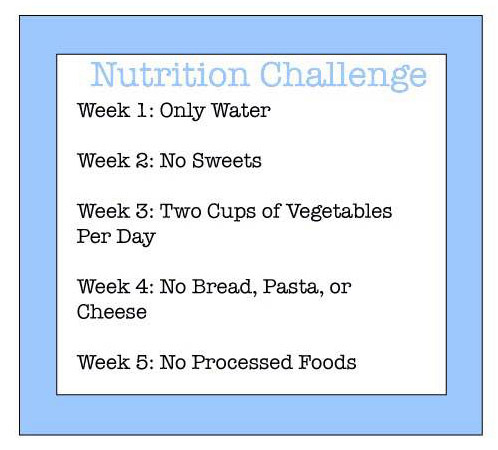 Method 2: Do each weeks challenge, then carry it into the following week. For example, you would go all 5 weeks with only drinking water if you did this method. This is very difficult but if you are up for the challenge – YOU GO GIRL! This challenge does not have the sole purpose of “cleansing” your bodies, like for example- a week long juice cleanse. This challenge is to get your body healthy by incorporating exercise and clean eating. Cleansing will naturally happen with your new clean eating methods. Every Friday for the next 5 weeks I will present you with the weeks challenge. Along with nutritional information, I will also give you a few recipe ideas to get you going for the week. Remember to incorporate Pinterest and maybe even make a special board just for the challenge! Join in on the community of women who are doing this challenge by using hashtag #eatpretty15 on your pictures via social media. If you have any questions along the way, please don’t hesitate to e-mail me. My email address is peachestopearls@gmail.com. Although I cannot give you an individual meal plan, I can help answer any questions of what you can and cannot eat. I’m going to end my post today with my favorite healthy dessert. This recipe is allowed this week because it’s naturally sweetened by coconut and does not have any processed sugar. I hope you enjoy it as much as I do! Thanks for stopping by and reading along today! In a small blender, add almond milk, 1 banana, shredded coconut, vanilla extract and sugar. Blend together until smooth. 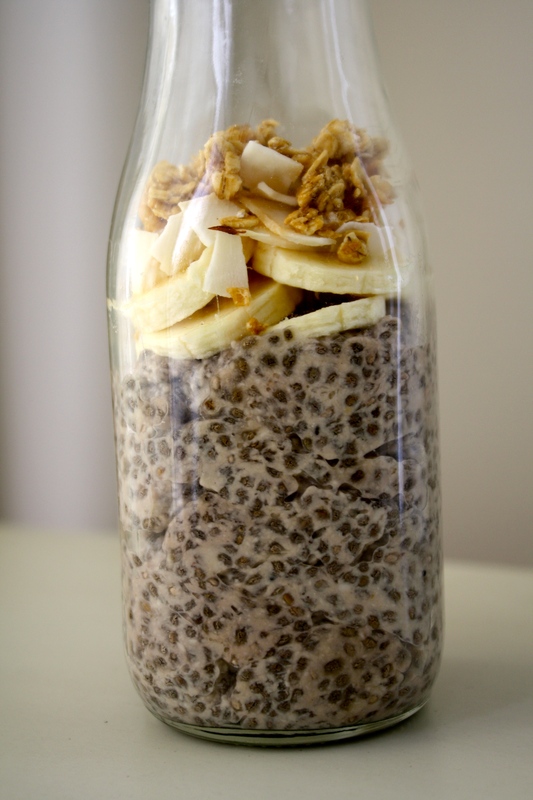 In a small container add liquid mixture in with chia seeds. 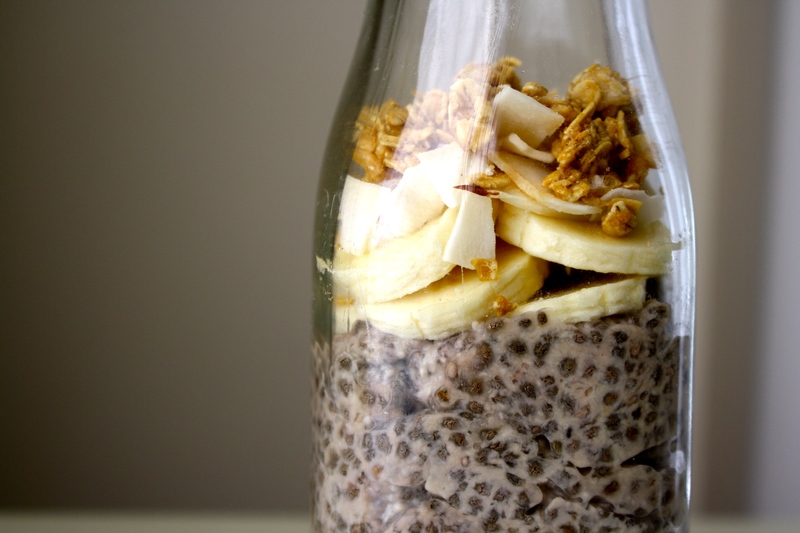 Top chia seed pudding with sliced banana, granola, and toasted coconut chips.